Swinging through the hills to Marreiros, with at three quarters of the route the opportunity to relax in the local restaurant with a nice view on an orange grove. Along the way several small lakes for a nice picnic, and if you are very quit you might see a turtle or even an otter. 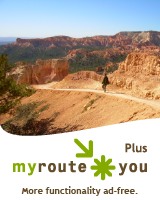 Try this feature for free with a MyRouteYou Plus trial subscription. If you already have such an account, then log in now.